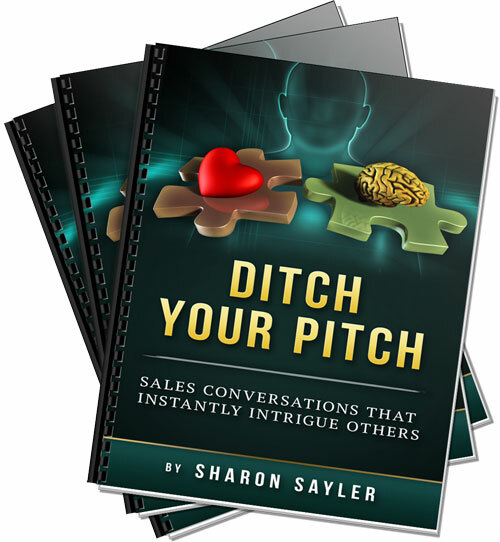 A three-lesson online course lead by me, Sharon Sayler, that will provide valuable, research-based tools, time-tested tips and hard-learned techniques that will show you how to ditch your pitch and speak from your heart whether your audience is 1 or 100s, for 1 minute, 10 minutes or an hour or more. Do you ever wish you could instantly intrigue others with what you do? Does it all come out in a way that doesn’t really ‘sell’ others that you are the answer they’ve been waiting for? If you are like me, you’ve learned through the school of hard-knocks that it’s a difficult marketplace today if you aren’t one to ‘toot-your-own-horn’ very loudly…it’s even tougher to be heard. And, I know, from being there myself, the last thing you want to be seen as is one of those infomercials people shouting “But Wait There’s More” or the Internet Spin Guru who are all hard-sell and smile and no substance. No wonder it feels as if we, as heart-centered specialists are getting sucked into having to sound salesy, slimily or sleazy with all the noise that’s out there now! I know first hand that it can feel hard! AND it doesn’t have to be hard….